C.F.A Voysey, probably made by George Wright. A rare cast iron fireplace with feeding character crows dining in a field, reminiscent of gentleman in tails. The fireplace has been professionally painted silver at some point which I was happy to leave. Alternately we can strip it back to the original black cast iron. Internal opening measures height to the arch 32" x width 15". Shelf is 5" deep. A complete French Gothic arched oak fireplace with its original overmantel mirror plate with projecting cornice with a wide oak frame and turned pillar details around the mirror and conforming larger turned details to the lower fronts. The sides have copper ventilation ports to help the fire burn faster or slower. Complete with it's original cast iron insert. 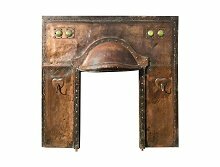 Height 82.75", Width 45.75", Depth 11"
An Arts & Crafts hand riveted copper fireplace in the style of M H Baillie Scott inset with Green Ruskin jewels and hand-hammered hearts with hand-wrought iron hooks to hang a poker, a brush and shovel upon. Height 39.5", Width 41.25", Depth 0.5"
William Burges Made by Francis Skidmore. 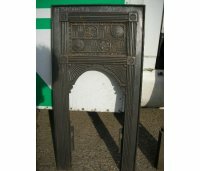 A rare and important Gothic Revival cast iron fire place insert. 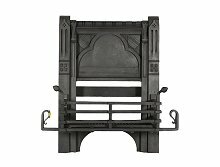 Height 49.75", Width 36.75", Depth 12.5"
A rare cast iron fire insert designed by Thomas Jeckyll. Made by Barnard Bishop and Barnard. Rare because it still has it’s original fan, they are usually always lost. This one has been specially cast without the sides boarder so a little smaller than the standard size. Registered Design BT 48/44. no 329036. 15th November 1878. 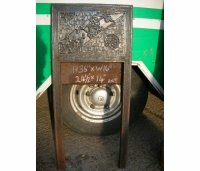 Height 36", Width 36", Opening Height 24 1/2", Opening Width 18"
A rare cast iron fire insert designed by Thomas Jeckyll. Made by Barnard Bishop and Barnard. Registered Design BT 48/44. no 329036. 15th November 1878. Height 36", Width 36", Opening Height 26", Opening Width 18"
Thomas Jeckyll. Made by Barnard Bishop Barnard. An extremely rare and Important Anglo-Japanese brass and gilt fireplace insert. A wonderful pure Art Nouveau cast iron stove in the Jugendstil style with brass overlaid stylised roses on fluid form stems. 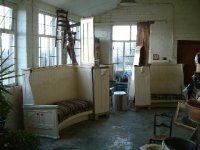 Three hinged doors, top two doors with Mica windows. Inscribed at the top of the arch with the model name – Sucession. The bottom door is inscribed - Firma, Jan Jaarsma, S. Gravenhage. Slight damage to RHS lower corner. C F A Voysey. 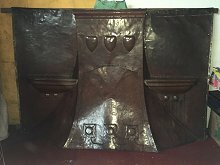 A cast iron fire place with his signature heart motif made by Thomas Elsley. This timeless design retains it’s original bars and grate. An impressive Gothic Revival oak fireplace surround attributed to Bruce Talbert with carved floral details to the top sides with turned supports with stunning hand painted tiles attributed to Mintons (AJS?) depicting cranes and wading birds in riverside scenes with further tiles in green with little winged dragons back to back in raised relief surmounted with four smaller blue triangular details and smaller brown lozenge tiles and green marble effect tiles with zig-zag details. Height 57", Length 78", Mantle Depth 15", Opening Height 45 1/4", Width 38 3/4". The opening measurements could easily be made smaller to accommodate most size inserts. Circa 1880. Thomas Elsley. An Aesthetic Movement cast iron fireplace with central kissing peacocks, flanked by sunflowers with honesty motifs in each upper corner. Height 58" , Width (at the top) 30" , width (of main body) 24". 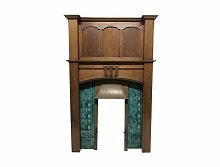 A complete Arts and Crafts oak fireplace with arched upper detail, complete with it's original 3" green tiled insert with a detachable copper hood. Ready to install. 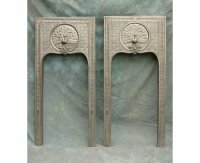 Height 68 1/2", Width at feet 42", Width of mantel 45", Depth of mantel 5 5/8", Width of opening 15", Height of opening 28". Circa 1900. A rare complete cast iron fire insert with original blue floral tiles designed by Thomas Jeckyll for Barnard Bishop and Barnard. Height 38", Width 39", Opening Height 26", Opening Width 18". Thomas Jeckyll for Barnard, Bishop and Barnard, a cast iron fireplace insert, with Japanese style decorative roundels on ribbed and blind fret grounds, cast 'Registered' and an indistinct Patent Office mark. See Soros, Susan and Arbuthnott, Catherine 'Thomas Jeckyll: Architect and Designer 1827-1881', p. 212, 213, 214 and 216. Measures 93cm high, 91.5cm wide. Opening :- 67 1/2 cm high, 45 15cm wide. 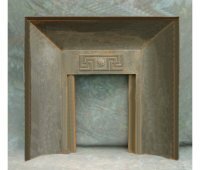 Dr Christopher Dresser (attributed) a cast iron fireplace, with zig-zag detailing and six inch tiles by Minton's, 96.5cm high, 102cm wide. Exhibited at New Century, Kensington Church St., London, 'The Selling Exhibition', 2nd to 19th June 1999. See Lyons, Harry 'Christopher Dresser The Peoples Designer', pl. F-016. Height 40", Width 38", Internal Height 27" Width 17 1/2". Circa 1900. An exceptional Glasgow School room interior and fireplace suite from an Arts and Crafts house. Attributed to M.H.Ballie Scott. 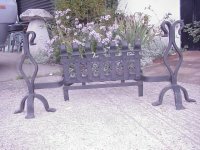 A hand forged iron grate with integrated andirons. Scroll details to the top and to the front. The grate measures 12" across at the very back, 10" along each side and 18" at the front where the grate starts, the fire dogs are 37" apart at the furthest toes and protrude 11" from the front of the grate to the front toe of the dogs, the overall depth from the front toe to the very back is 21". Liberty and Co, An impressive Arts and Crafts oak fire surround with two upper cupboards set with green tinged stained glass doors with iron ring pull handles. 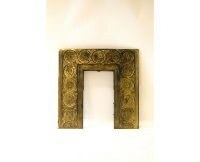 Brass moulding to the fireplace opening. Original enamel label to the back. Height 90 1/2", Width of cornice 70 3/4", Depth of cornice 10 3/4", fire opening opening 39" x 34". An almost identical version is illustrated in the Pictorial Dictionary of British 19th Century Furniture Design, page 372 shown in the last image. An Arts and Crafts oak fire surround by Shapland and Petter with five Heart carvings to the top flanked by tapering columns with a central circular detail. Height 78", Width of cornice 65 3/4", Depth of cornice 9 3/4", fire opening 37 1/2" x 37 1/2". Circa 1895. A good Arts and Crafts oak fire surround with flaring cornice and three central shaped supports flanked by stylised floral carvings to the tops with acentral bevelled mirror and curved shelf with a single angled support. 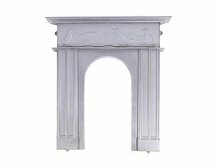 Height 78 1/2", Width of cornice 68 1/2", Depth of cornice 11", fire opening 36 1/4" x 36 1/2". Circa 1895. Height 5', Full width of mantle 55 1/2", Depth at the end's of the mantle 5 1/2", Width of the shelf below the mantle 44", Depth of the shelf below the mantle 4 1/2", Opening Height 38", Opening Width 37", Width at the feet 50 1/4". Circa 1900. This one is sold but I have a painted white one available in stock. An Anglo-Japanese cast iron fireplace with deeply curved reflective sides and honesty motif with rose detail to the centre. Height 40 1/4", Width 42", Internal Height 24", Internal Width 18". Circa 1875. Designed to have tiles down each side or used as is. Height 36" 91.5cm , Width 17" 43cm. Thomas Jeckyll. Made by Barnard Bishop and Barnard of Norwich, ready for tiles. Height 38", Width 36". Internal Height 26 1/2", Internal Width 16 1/2"
Thomas Jeckyll. Made by Barnard Bishop and Barnard of Norwich. Height 36", Width 18 1/2", Height of opening 23 1/2", Width of opening 12". 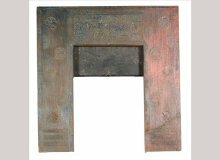 An Anglo-Japanese cast iron fire insert which shows strong design similarities between Thomas Jeckylls work for BBB and E W Godwin for S S and Shorland Manchester under the cape of Ernest Hooper. Height 36", Width 18", Height of opening 24 1/2", Width of opening 15". Circa 1880's. An Aesthetic Movement cast iron fireplace with two love birds below peacock feathers to the centre flanked by Sunflowers and honesty motif's to the upper sides. Made by Thomas Elsley. Important casting co also made for C F A Voyesy. Height 58", Width at the top 30", Width of main body 24". Circa 1885. 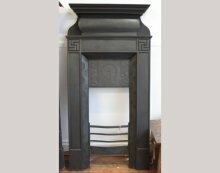 An Arts and Crafts cast iron fireplace attributed to CFA Voysey with simple heart detail to the top and a subtle sweeping mantelpiece. Height 40 1/2", Width at the top 28 1/2", Width of main body 20 1/2". Circa 1900. 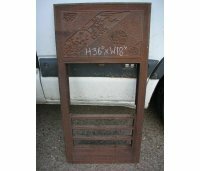 An Arts and Crafts cast iron fireplace with stylised floral details. Height 58", Width at the top 30", Width of main body 24". Internal Height 30 1/2", Internal Width 16". Circa 1900. 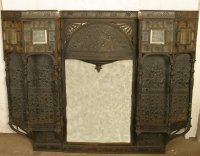 An Arts and Crafts cast iron fireplace with matching cast iron overmantel with arched top and central bevelled mirror, stylised floral details and repousse hearts. I also have a spare over mantle. Height 65", Width at the top 33 1/2". Circa 1900. An Arts and Crafts log basket with integral andirons in the style of Ballie Scott. With stylised floral details to the copper hood. Perfect for an inglenook fireplace, any lingering smoke is helped up the chimney via the copper hood. Height 42", Depth 17", Width from the edges of the decorative scrolls 36 1/2". Circa 1900. A large Arts and Crafts copper insert with a Lion in a shield within a stylised floral boarder, inset with three Ruskin jewels below flanked by six stylised roses, with two further rosettes to each leg and thorn details to the base. Height 48", Width 50", opening Height 37 1/2", opening Width 36 1/2". 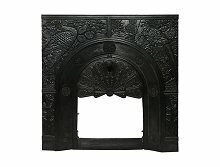 An Arts and Crafts cast iron fireplace withstylised floral details to the upper front and to the lower sides with subtle details running up. Height 50", Width at the top 36". 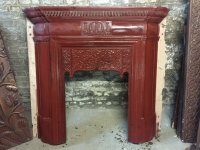 A good quality late Victorian or early Edwardian fireplace. Height 40", Width at the top 30". 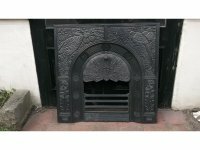 A very interesting late Victorian or early Edwardian fireplace with stylised dragons and stylised floral details. No grate. Height 39", Width at the top 30 1/2". A late Victorian fire with stylised floral detail to the top. An Arts and Crafts fireplace with stylised floral details. Height 38", Width of body 28". A good Arts and Crafts fireplace with stylised floral details. A tall Arts and Crafts fireplace with stylised floral details, in the style of Ballie Scott. Height 51", Width of body 31". A late Victorian or early Edwardian fireplace with stylised floral details. Height 36", Width of body 28". 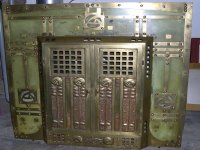 A late Victorian or early Edwardian fireplace with stylised bluebell details, painted version of above. Height 40", Width of body 30". 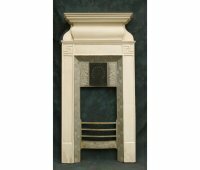 A late Victorian or early Edwardian fireplace of simple form. 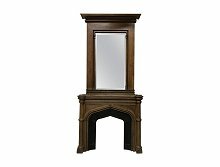 Height 52", Width of mantle 43 1/2", Internal Height 33" Internal Width 24". A late Victorian or early Edwardian fire insert with painted scenes to the tiles. A late Victorian or early Edwardian tiled fireplace insert. This would need replacement tiles as one side some have been damaged. 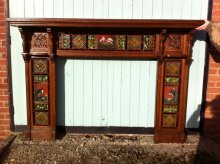 A late Victorian or early Edwardian tiled fireplace insert. The tiles could easily be replaced with something more decorative. 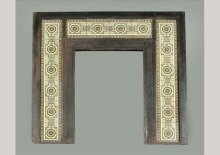 A late Victorian or early Edwardian fire insert with tiled sides. The tiles could easily be replaced for something more decorative. A late Victorian or early Edwardian fire insert requiring a set of ten tiles for the sides. An Arts and Crafts fireplace with dome topped stepped mantle and stylised Peacock detail to centre and subtle shaped sides. A wonderful cast iron fireplace in the style of CFA Voysey with two cat's watching a mouse. A Glasgow School fire insert. 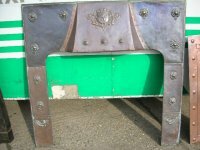 An Anglo-Japanese cast iron overmantle designed by Thomas Jeckyll. Made by Barnard Bishop and Barnard. Almost identical to one designed for Stephan Lycett Green for their Yorkshire home, exhibited by The Fine Art Society in 1972 'The Aesthetic Movement and The Cult of Japan' also illustrated in The Decorative Arts Society 1850 to Present. Journal 25 2001, page 41. Height 40", Width 52", Depth 6". Circa 1870's. An Arts and Crafts oak fire surround with egg and dart mouldings central mirror flanked by cupboards with stain glass and stylised floral carved tulip details and square upright columns. Height 76 1/2", Width of cornice 67", Depth of cornice 11", fire opening 36 1/4" x 36 1/2". Circa 1895. 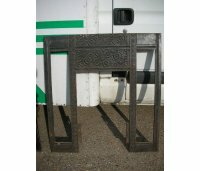 An Arts and Crafts Glasgow Style cast iron fireplace with stylised floral detailsand heart motifs to the top sides.